For information about you such as name and address that remains constant, you iPhone’s Safari app’s AutoFill feature automatically fills in common fields with your personal information with a single tap instead of requiring you to fill in those fields individually. Safari can also keep track of user names and passwords and credit card information. What’s more, when you create a new account on a website, Safari asks if you want it to generate and memorize a password for you. Use Contact Info: Tap On and Safari fills in online forms with your personal information. That personal information is pulled from your information in Contacts. You should see your own name in the my Info option field. When you are filling in a form, tap AutoFill on keyboard and Safari copies the information you have saved in the name, address, phone number, and e-mail address fields of your own Contacts card and pastes those bits of information into the appropriate fields. If you don’t see your name in the my Info option field, tap that field to display your Contacts, and then locate and tap your own Contacts card name to select it as the card you want to use for the my Info option. 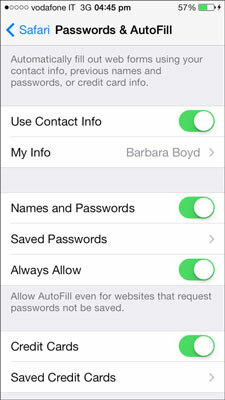 Names and Passwords: Tap the option On if you want Safari to remember any user names and passwords you type to access certain web pages. The first time you type your name and password on a web page that requires that information, Safari displays a pop-up message, asking if you’d like to save the password. Tap Yes if you would, Never for This website if you never-ever-ever want to save the password for the web page, or Not Now, if you don’t want to save the password right now, but you want to keep your option of saving the password open the next time you visit the web page. Saved Passwords: Tap to see a list of websites for which you have a saved name and password. Tap the disclosure arrow to the right of the website to see the user name and password spelled out. To delete any of the websites, tap Edit in the upper right corner. Tap the radio button to the left of the website you want to delete; a check mark appears. Tap the Delete button in the upper left corner. Always Allow: Tap on to override websites that prefer passwords not be saved. You have to have Passcode Lock turned on to enable this option and if you don’t, when you tap it on, you’re automatically led through the steps to create one. If you turn off Passcode Lock, a dialog asks if you want to continue to use AutoFill in Safari since without the security of a Passcode, anyone who uses your iPhone could access any AutoFill information you keep in Safari, including your stored credit card information. Use AutoFill without a Passcode only if you keep your iPhone chained to your body. Some websites have a Remember Me option for usernames and passwords that works if you accept cookies, in which case Safari doesn’t ask if you want it to remember because the website takes care of that. Credit Cards: If you shop frequently online, this feature can be a real timesaver. 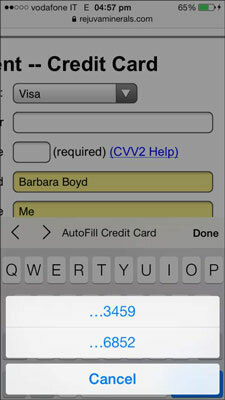 Tap on and then tap Saved Credit Cards➪Add Credit Card to add your cardholder information to Safari. When you purchase something online, tap in the credit card field and then tap AutoFill Credit Card. If you sync Safari with iCloud, all your auto-fill information is available on all devices and computers that sync with iCloud. Tapping the Upload button on sites like Flickr or eBay opens two choices for uploading photos: Take Photo or Video, which opens the Camera app and uploads the image directly from Camera to the website, or Choose Existing, which opens Photos allowing you to select the image you want to upload.